How Much Cargo and Passenger Space does the 2019 Mazda CX-3 Offer? Home » Mazda CX-3 » How Much Cargo and Passenger Space does the 2019 Mazda CX-3 Offer? Shoppers in the market for a new crossover SUV are in need of comfort and versatility. Fortunately, the 2019 Mazda CX-3 offers drivers and passengers near Lodi, NJ a spacious interior that is loaded with cargo and passenger space, as well as a host of additional comfort and convenience features. Keep reading to take a closer look inside the cabin of the new 2019 Mazda CX-9 at Mazda of Lodi in Bergen County, NJ! Check Out Our Inventory Of New 2019 Mazda CX-3 Models! The 2019 Mazda CX-3 is spacious and comfortable, offering 38.4 inches of front headroom (37.2 inches of rear headroom), 55.5 inches of front shoulder room (50.4 inches of rear shoulder room), 52.3 inches of front hip room (49 inches of rear hip room) and 41.7 inches of front legroom (35 inches of rear legroom). The 2019 Mazda CX-3 can easily seat five passengers across two rows of seating. The second row of the Mazda CX-9 features 60/40 split fold-down rear seats. The Mazda CX-3 offers 12.4 cubic feet of cargo volume behind the rear seats; the total cargo volume expands to 44.5 cubic feet when the second row of seats is folded down. When the Mazda CX-3 is equipped with the Bose® Sound System (optional on Touring models and standard on Grand Touring models), the cargo volume is reduced to 12.4 cubic feet behind the rear seats and 41.7 cubic feet when the second row is folded down. 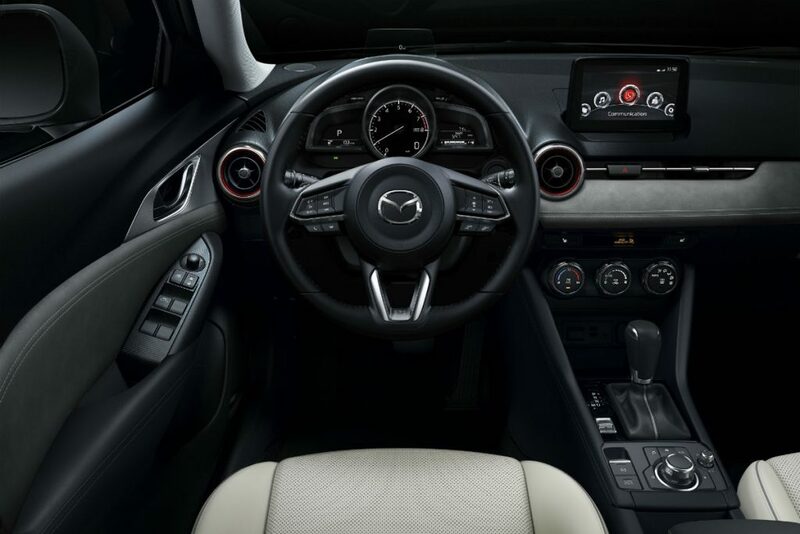 In addition to spaciousness and versatility, the interior of the new 2019 Mazda CX-3 offers drivers comfort and convenience thanks to a number of features available across all trim levels, including a standard MAZDA CONNECT™ Infotainment System with a seven-inch full-color touchscreen display, available leather seating, front and rear USB charging ports, heated seats and more. If you’d like to learn more about the new 2019 Mazda CX-3, simply contact us or stop into Mazda of Lodi in Bergen County, NJ and speak with a friendly and knowledgeable member of our team! We’re here to help with all of your Mazda and service needs! Schedule a test drive of a new Mazda model today! This entry was posted on Wednesday, September 19th, 2018 at 8:22 pm	and is filed under Mazda CX-3. You can follow any responses to this entry through the RSS 2.0 feed. You can skip to the end and leave a response. Pinging is currently not allowed.